Jerry Colvin, 75 died Wednesday, September 23, 2009 in Paris, Tennessee. His wife, Mary Lou Geis Colvin, survives. Born September 19, 1934, in St Louis, he was the son of Effie Avery Colvin of Paris and the late Fayette Colvin. A career U.S. Army veteran, Colvin served for 29 years, retiring as a major. He served in the Korean War and two tours of duty in the Vietnam War. He also leaves two daughters, two sons, seven grandchildren and three great-grandchildren. Memorials may be made to the First United Methodist Church Food Pantry, 101 E. Blythe Street, Paris, Tennessee. 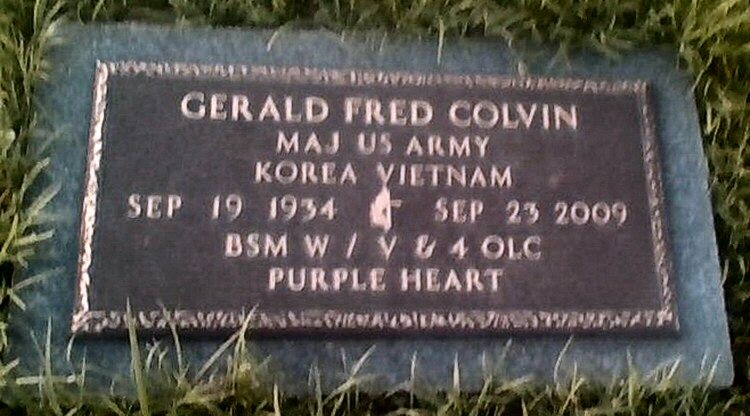 Grave marker for Gerald F. Colvin in Memorial Cemetery, Paris (Henry county), Tennessee. Gerald F. Colvin, 24, son of Mr. and Mrs. Fayette E. Colvin of 102 Hillside St., is a member of the 2nd Armored Division in Germany. A squad leader in Co. 4 of the division's 42nd Inf Bn., Sgt Colvin entered the Army in 1950. He arrived in Europe for this tour of duty in 1955. The sergeant holds the Purple Heart and the Combat Infantryman Badge among his decorations. He attended Bennington High School. His wife, Jeannine, is with him in Germany. FORT BENNING, GA.·-- Army Sgt. 1.C. Gerald F. Colvin, son of and Mrs. Fayette I. Colvin, has completed the four-week-airborne course at the infantry; School, Fort Benning, GA.
. Sergeant Colvin qualified as a· parachutist and received training in the duties of a jumpmaster. He entered the Army in 1949. Sgt 1.C. Gerald F. Colvin, 30, wose wife, Jeannine, lives at 100 Barber St., Bennington, received the Vietnamese Cross of Valor from the Republic of Vietnam, while assigned to the Army element of the U.S. Advisory Group, Military Assistance Command, Vietnam (MACV), July 4. MACV is an Army - Navy-Marine · Air Force organization which advises and assists the armed forces of the Republic of Vietnam on training, use of equipment and tactical operations. Sgt. Colvin entered the Army in 1949 and arrived In Vietnam in March of this year on his present tour of duty. The sergeant, son of Mr. and Mrs. Fayette I. Colvin of North Branch Street Extension, attended Bennington High School. M.Sgt. Gerald F. Colvin of Bennington, one of 28 United States special airborne troop advisors in Viet Nam and one of three in this group In the famed Airborne Brigade who has earned the right to wear the distinctive red beret and an equally distinctive camouflage suit, is scheduled to receive the Bronze Star in the Far East this week. Word to this effect was received by his wife, Jeannine, who with their three children, resides at 100 Barber St. and by his parents, Mr. and Mrs. Fayette Colvin of North branch Street Extension. The master sergeant is a veteran of the Korean Conflict and holds the Purple Heart after being seriously wounded in action there. A graduate of jump school, ranger school and the language school at Monterey, Calif., he was attached to the training company at West Point Military Academy prior to leaving the states. A story last week in the Boston Record American by the paper's correspondent, Bill McSweeny, is devoted to the famed Airborne Brigade, and calls attention to the three advisors, all from New England, entitled to wear the red beret. At the time he interviewed one of the advisors, he said Sgt. Colvin and the other red beret advisor were "off on operations." The Bennington man was pictured with a soldier during a mission In Viet Nam Dec. 30. McSweeny writes that the red beret and camouflage suit are the proudest possessions of the brigade and adds that "even on black market the only thing you can't buy Is an Airborne uniform or a red beret -- it has to be earned." U.S. advisors are given two uniforms when they arrive. That is their uniform in South Viet Nam. The writer continues: of the few people who have earned it (the red beret) three are from New England. There are 28 U.S. Airborne. so three out of 28 is a pretty good percentage, particularly when you consider that this unit is so selective that .they hand pick their advisors before they leave the United States. M.Sgt. Colvin received the Vietnamese Cross of Valor last July 4. McSweeny said he was most Impressed with advisory personnel. The Airborne Brigade is the only unit in Viet Nam which is completely volunteer. The six battalions of the AB are the oldest units of the Republic of Viet Nam and they celebrated their ninth anniversary recently. That number is only from the date of the formation of South Viet Nam. Actually the AB has been In battle since 1945. The other two advisors entitled to wear the red beret are a captain from Rehoboth, Mass., and a master sergeant from Waltham, Mass. M.Sgt. Gerald F. Colvin of Bennington, one of the 28 U.S. special airborne troop advisors in Viet Nam will receive the Bronze Star Medal there this week his wife and family have been informed. He received the Vietnamese Cross of Valor last July as a member of the Airborne Brigade, the only unit in Viet which is completely volunteer. He also has the Purple Heart for wounds received in Korean War. Dispatches from Viet Nam say that Colvin is one of three in the famed brigade who the red beret, symbol of top excellence. M. Sgt. Gerald F. Colvin was promoted to the grade of sergeant major. He is the son Mr. and Mrs. Fayette Colvin North Branch Street Extension. His wife Is the former Jeannine Garceau, who with their four children, resides at 100 Barber St. The sergeant major Is a newly created rank In the Army. FORT BENNING, GA --- A soldier, Gerald F. Collvn of Bennington, Vt., who entered the army at 14 and subsequently became one of the youngest sergeants-major at the age of 31, received a direct commission with rank of captain in a ceremony Nov, 15 at Fort Benning. An instructor in combat intelligence at Fort Benning's Ranger Camp in Florida, Capt. Colvln is a graduate of the infantry School airborne and ranger courses. He is scheduled lo take course here before joining the advanced infantry training brigade at Fort McClellan, Ala.
After attending the military assistance training advisor course at the Special Warfare Center at Fort Bragg, N.C., and studying at the Defense Language Institute at Monterey, Calif., Colvin was assigned as an advisor to the Vietnamese Airborne Brigade, 1st Airborne Battalion in 1964 and 1965. In addition to his tour in Vietnam, Colvin served with the 2nd Inf Div , 38th inf, Regt., in Korea. He was a platoon sergeant with the 2nd Armored Division, 50th Inf., In Germany from 1955 to 1957. He went back to Germany In 1959 and served a year with the 21st Inf., 24th Div. Colvin's experience as an instructor and advisor includes a tour with the U.S. Military Academy, where he taught the RECONDO (modified ranger training) course. The captain's decorations include two awards of the Combat Infantryman badge, two Bronze star medals with "V" device, the Army Commendation medal, the Purple Heart, six awards of the Good Conduct medal, the Vietnamese Cross of Gallantry, the Vietnamese Fourragére, Master Parachutist Wings and Vietnamese Jumpmaster Wings. Capt. Colvln. a graduate of Bennington High School, Is the son of Mr. and Mrs. Fayette Colvin. His wife is the former Jeannine Carceau, They formerly lived on Barber Street, Bennington, with their three children, Mark, Kevin and Cheryl.